There’s a game played in France that might almost be dubbed the nation’s national sport. They call it Petanque. OK, some people call it “boules” but that’s really the name of the balls used in Petanque. It began in Greece in 6 BC, moved to Rome whose soldiers and sailors introduced it to Provence and by the Middle Ages it was being played all over Europe. Until England’s King Henry III banned his archers from playing it and in the 14th century France’s kings Charles IV and Charles V forbade commoners from playing the sport. Only in the 17th century was the ban lifted. 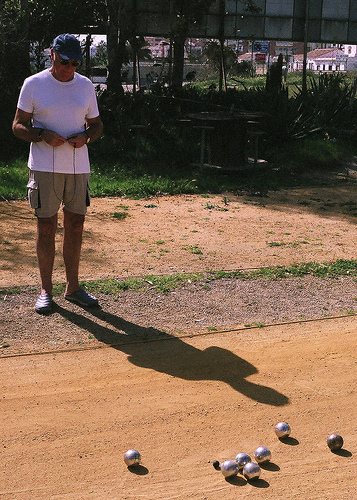 “The game of Petanque holds a special place in French life. It is virtually impossible to travel through France without coming across a group of men in a local village square relaxing and socializing over a game of petanque. Yet it is far from just a trivial pastime. In France there is an official association to whom you have to apply for a permit before you can even consider competing seriously! “The form of Petanque played today originated in 1907 in Provence and consists of throwing a hollow metal ball, from a designated, standing position, to land as close as possible to another smaller wooden ball, known as the jack. This entry was posted in Provence, Provence Escapes and tagged Boules, European Waterways, France, games, Pétanque, Sports on July 11, 2013 by Rich Steck.